Majority-republican Texas legislature set to vote on new pro-gun laws, like open-carrying handguns in public and sales tax holiday on firearms (Reuters). Pro-small-business legislation, covering federal contracts, saddled onto $1.1 trillion spending bill (WP). 4 killed in Mississippi after 18-wheeler plows into accident-stopped traffic on I-10 (Reuters). After bicameral passage, $1.1 trillion spending bill lands on Obama's desk, mostly locking current spending levels (HC). Cop buys eggs for woman caught shoplifting to feed her destitute family (TOI). Uninsured number falls under Obamacare: Medicare / Medicaid payments still fall short, while law cuts hospital funding; health-care industry windfall beats expectations, booming new market for prescription drugs (LAT). Rule-breaker, outside-insider Elizabeth Warren gains influence on the left, while pushing it further left (WP). Thousands, including prominent civil rights leaders, march through DC / NYC / Chicago / Boston, protesting black men's death at the hand of the police (CT). American net wealth: near-retirees have average assets of $170k, all-inclusive (401k, savings, home equity, cars, etc.) 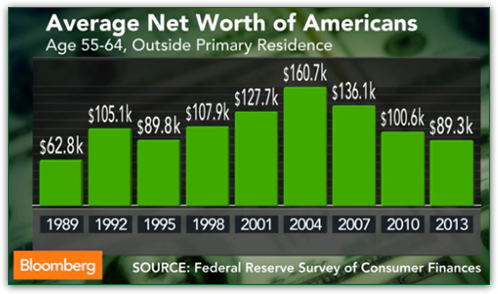 With mortgage, median American (middle class, by definition) has a net worth of $210k, but still has a $40k debt. Federal government employees' pensions are doing best; many state pensions are underfunded (BW). Despite oil boom, Venezuela's mismanaged economy nears default (CNN). NYT Bits blog: Amazon "Jeff Bezos' Lemonade Stand" (NYT). Nasdaq 100 re-ranking - IN: American Airlines, Electronic Arts, Lam Research. OUT: Expedia, F5 Networks, Maxim Integrated Products (Reuters). Amazon UK hour-long glitch via "Repricer Express" software yields number of items sold for pennies, during peak Christmas shopping (CNET). Script of next James Bond movie ("Spectre", Nov 2015) also stolen during Sony hack (BBC). New software-enhanced, holographic microscopy technique developed by NYU physicist with off-the-shelf equipment, potentially replacing electron microscopes, which cost millions (SA). Following DOJ overreach on emails stored outside the US, Microsoft appeals in major precedent-setting case (TG). After 7th documents release, Sony hackers promise "Christmas Gift", as logistic and PR problems mount for the company (Yahoo). Detailed look at upcoming Windows 10 and Cortana, Microsoft's Siri-like virtual assistant (Giz). In Sidney, Lindt cafe under siege by gunman who forced hostages to hold Islamic flags against the windows (The Age Live Updates). Newfound Israel Tamar natural gas field, supplying half the country's electricity needs, is both a target and diplomatic tool with energy-hungry Egypt and Jordan (NYT). 23 supporters of cleric Fethullah Gülen detained in Turkey, in crackdown against opposition (TG). Sterile peace talks in South Sudan as civil war marks first anniversary; 10,000 dead since, and 2 million displaced or refugees (Age). US citizen illegally in North Korea denounces US human rights record and "imperialist influence", seeks asylum in Venezuela (Reuters). Projected China growth to fall further 0.3%, to 7.1% (WSJ). Sweden confirms Russian spy plane incursion, near-miss collision with passenger plane (TOI). Israel PM rejects withdrawal timetable from occupied territories; upcoming meeting with Palestinian counterpart and US state sec. John Kerry; latest peace negotiations collapsed last April (TG). After violent protests over postponed elections, Haiti PM resigns (BBC). Despite economy, landslide victory for Japan's current PM Shinzo Abe's party with 306 projected seats won, strengthening existing majority (NYT). Indonesia landslide's death toll rises to 26, with dozens still missing (BBC). Greece stays EU's weakling, misses latest budget targets; 25.7% unemployment, 49.3% youth unemployment, 174.1% debt-to-GDP ratio. (Forbes). At least 129 dead from drowning after ferry capsizes in DR Congo (Yahoo).